Visiting Ypres, or Ieper to use its modern name, is an amazing experience. First, there is the sheer wonder of wandering around a seemingly historic city that, on closer inspection, proves to be of very recent completion. Then, there is the impressive scale of the massive Cloth Hall, the great medieval trading market that attracted merchants from across Europe. But, that too proves to be a bit of curiosity when stared at, as the mix of very smooth, sharply cut stone merges with the pock-marked, scarred and worn pillars along the ground floor. Next to the Cloth Hall is a soaring medieval cathedral, but enter inside and it feels so new you almost expect it to squeak as it comes out of the shrink-wrap. Finally, there is the Menin Gate, a huge memorial to the British and Commonwealth missing of the Ypres salient. Tucked into the ramparts, the Menin Gate almost leaps out on the visitor walking along the street from the central square (the Grote Markt). It is the Menin Gate that provides the key to the rest of the mystery, for it commemorates the fact that this charming West Flanders city witnessed some of the most intense and prolonged fighting on the Western Front between 1914 and 1918. During that fighting Ypres was reduced to rubble and ashes only to rise again in replica form. Battlefield tourism (or “pilgrimage,” as it was called during the inter-war period) has been at the heart of this process of bringing the war home since 1918. 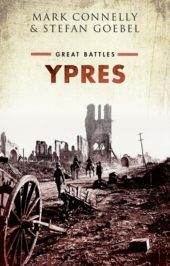 For the British the city was a site of pilgrimage, as summed up in the title of an early guidebook, Ypres: Holy Ground of British Arms. The British came to see ground made sacred by the bloody sacrifice of countless soldiers from the British Empire. Running alongside this reverential mode was standard tourism, as British people sought to buy souvenirs from the city and have home comforts. By the mid-twenties Ypres’ businesses were appealing directly to the British. “If you want a cup of good strong English tea have at the Tea Room”, was one café’s advertisement. What another guidebook, the Baedeker, noted in 1930 still holds true today, namely that Ypres had “acquired a certain English air.” Today’s visitor, walking the streets of the “medieval” town, attending the daily remembrance ceremony at the Menin Gate or visiting a war cemetery on the outskirts of the city, is unlikely to bump into a German battlefield tourist; even at the German war cemetery at Langemarck (some six miles northeast of the city) anglophone visitors greatly outnumber their German counterparts. This was not always the case. Langemarck had once occupied a special place in the German memory of the Great War. It was the site where war volunteers had allegedly marched into death singing “Deutschland über alles” in November 1914. The memory of their noble “self-sacrifice” became a rallying cry for the political right during the 1920s and 1930s. When the Wehrmacht overrun Belgium in May 1940, this was celebrated as “Second Langemarck.” After 1945, following a hiatus of several years, German veterans of the First World War returned to the city for the 50th anniversary celebrations, often at the invitation of the city keen to foster a spirit of reconciliation. With the passing away of the veterans during the 1970s, the presence of German visitors in and around Ypres declined dramatically – precisely at the moment when British battlefield tourism started to increase again. Most German veterans went to their graves with their war stories, and only a few families toured the battlefields in the hope of recapturing something of the war experiences of their grandfathers. Flanders – the mere mention of the name could still send shock waves through the generation of survivors in the 1950s – faded from German collective memory and largely disappeared from tourist itineraries. The new generation no longer felt a deep emotional connection to the war dead and the landscape of the Ypres salient. Featured image credit: Menin Gate in Ypres, Belgium, in 2009 by Mikefield. CC BY-SA 4.0 via Wikimedia Commons. Mark Connelly is currently Principal Investigator of 'Gateways to the First World War', an Arts and Humanities Research Council-funded centre for public engagement with the Great War centenary. He is also convenor of the Masters Programme in First World War Studies at the University of Kent. Stefan Goebel specializes in the comparative cultural history of the Great War and in the urban history of modern conflict. He is director of the Centre for the History of War, Media, and Society at the University of Kent.